Virgin Australia says a proposed new codeshare arrangement between Qantas and Air Niugini will erode competition and should be rejected. In a submission to Australia’s International Air Services Commission (IASC), Virgin said the proposed codeshare services would have a “negative effect on the Australian aviation industry, particularly in relation to the Brisbane-Port Moresby route”. “In Virgin Australia’s view, these variation applications should be rejected on the basis that the proposed use of the relevant capacity will not be of benefit to the public,” the airline said in its submission, dated September 30 and published on the IASC website on October 4. In July, Qantas announced plans to end flights between Cairns and Port Moresby, currently operated by QantasLink Q400 turboprops, and launch a daily Brisbane-Port Moresby service with Boeing 737-800s. The change, which Qantas said was to better serve the business market, was due to take place on October 30. Currently, Qantas and Air Niugini have a codeshare arrangement where the Australian carrier adds its QF airline code on the PNG carrier’s flights from Port Moresby to Brisbane and Sydney. There is no codesharing on the Cairns-Port Moresby route, on which currently Qantas operates up to 12 return flights a week with Q400 turboprops and Air Niugini operates up to 11 return flights a week with Fokker 70 jets. On September 5, Qantas applied to the IASC to codeshare on the Air Niugini’s Cairns-Port Moresby service as part of an updated agreement to reflect the Australian carrier’s network changes to Papua New Guinea. Qantas and Air Niugini would also codeshare on each other’s Brisbane-Port Moresby service, while Qantas would maintain its codeshare on the PNG carrier’s Sydney-Port Moresby flights. 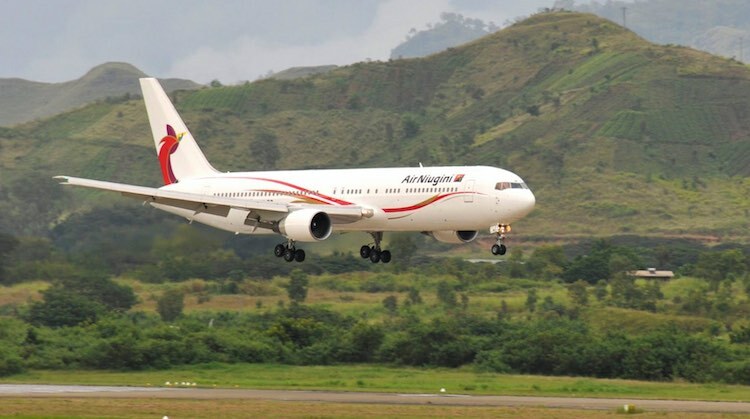 Meanwhile, Air Niugini said in a submission to the IASC dated September 9 it might have to withdraw widebody services on Brisbane-Port Moresby – the airline serves the route with a combination of 767-300ERs and 737-800s – if the proposed new codeshare agreement with Qantas was rejected. Further, Air Niugini said there was a “material risk” it would withdraw from the Sydney route given there was “insufficient demand” to maintain an independent operation. Virgin, which started flying between Brisbane and Port Moresby in November 2008 under the Pacific Blue brand, currently operates six flights a week on the route with Boeing 737-800s, with a seventh weekly flight added during peak periods. It is the only other airline from either country offering scheduled passenger flights between Australia and Papua New Guinea apart from Qantas and Air Niugini. PNG Air, previously known as Airlines PNG, operated Cairns-Port Moresby until December 2013. Virgin said the both the current and proposed Qantas-Air Niugini codeshare arrangements were the “single most significant barrier to entry on the PNG route”. “Accordingly, the codeshare arrangements are themselves acting to restrict competition in air services between Australia and PNG,” Virgin said. Virgin noted total passenger numbers on the Australia-PNG route had fallen from about 315,000 in 2012/13 to less than 300,000 in 2015/16 in line with a weaker PNG economy, with Qantas and Air Niugini carrying more than 80 per cent of all passengers on the route and Virgin picking up the remainder. Freight volumes in both directions had also trended downwards since 2012/13. It said the market was dominated by business travel, so price discounting did little to stimulate additional demand, and reliant on committed revenue earned under contracts with companies whose employees undertook a large amount of travel. While the recent figures highlighted some softness in the PNG economy amid the declines in global commodities prices, Virgin said the prospects for the route in the period ahead were encouraging. And should Qantas and Air Niugini be able to implement their proposed new codeshare arrangements, the pair would be in a strong position to take advantage of an upturn in the PNG economy given “limited competition”. “The PNG economy is expected to strengthen in the coming years, as a number of major oil, gas and mining projects in the country progress towards final approval and construction stages,” Virgin said. On the Brisbane-Port Moresby route – which carries 60 per cent of all traffic between the two countries – Virgin said the combined schedule of Qantas and Air Niugini would result in a double-daily offering, compared with its own six flights a week. “Allowing Qantas and Air Niugini to increase their market power on the route through expanded codesharing will make it very difficult for Virgin Australia to win, or even retain, corporate business on the route,” Virgin said. “On a route dominated by business traffic, this is critical. Such an impact could be expected to threaten the viability of our continued operations on the PNG route. Meanwhile, Virgin expressed some frustration the current air services agreement between Australia and Papua New Guinea only allowed for codesharing with airlines of each country and not third-party carriers. Further, it said there appeared little appetite from the Papua New Guinea side to negotiate a new bilateral agreement, noting the “PNG delegation’s failure to attend scheduled air services negotiations in Canberra in March 2016, following on from two previous rounds in August 2011 and September 2012 at which no outcome was agreed”. “This is particularly problematic for Virgin Australia, as we wish to secure a third country codeshare provision under the arrangements to enable our alliance partners to codeshare on our Brisbane-Port Moresby services,” Virgin said. Further, Virgin noted there was only 400 seats per week available to Australian carriers for new services under the current bilateral, with the rest already utilised by itself and Qantas. “Certainly, this quantum of available capacity is inadequate to allow Australian carriers, either current operators or prospective new entrants, to develop plans for expansion on the route beyond the short term,” Virgin said. Qantas said in a submission to the IASC dated September 14 the codeshare arrangements with Air Niugini had been in place since 1987 and were “instrumental in maintaining and growing air services in a historically challenging market, dominated by corporate traffic flows, with relatively limited opportunities for tourism growth”. “Against this background, the codeshare arrangements have delivered significant public benefits in the form of increased competition, efficiencies and lower operating costs, which have in turn provided a wider range of services and choice for consumers than could be provided by each carrier operating alone,” Qantas told the IASC. The Qantas, Air Niugini and Virgin submissions can be read in full on the IASC website. Virgin Australia acting straight out of Branson’s playbook. Oppose every alliance or change to it. Claiming that the fact they can’t add third country flight numbers through code share may have some validity but seriously if Virgin really thought there was the traffic, they would be competing with more than 1 B738 service 6 times a week. Correct, Virgin offer nothing but a token service on many routes and the make out that other airlines or external factors prevent them from lifting their service, it’s a load of rubbish. Good on Virgin! Qantas an arrogant bunch of colonials who think PNG is still their colony. Be a good idea to update your info on QF……..
What a load of codswallop you wrote!